Facts and figures add up to Baby Don’t Cry smashing her rivals in Sunday’s Wagga Whiz (1000m). 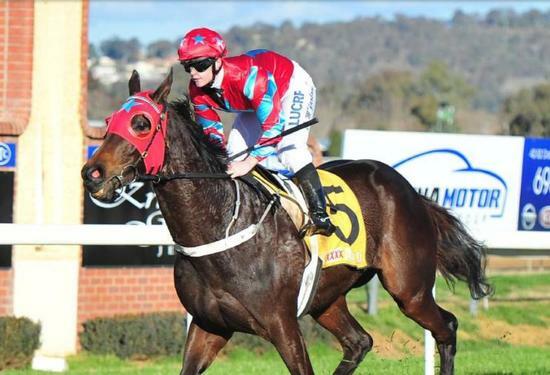 The mare won by almost four lengths on a heavy track at Wagga on August 1 and rises in the weights by two and half kilograms. “It looks a nice race for her again and the heavy track will also be in her favour,” trainer Craig Widdison said. Canberra apprentice jockey Patrick Scorse will reduce Baby Don’t Cry’s weight to 57.5 kilograms – 3.5 kilograms less than the resuming top weight Man Of Peace. The Wagga trained galloper hasn’t raced since finishing a gallant fourth in the Wagga Town Plate in May which followed a win in the Plate prelude. While he has never won first-up, Man of Peace has been placed at three of his four fresh starts. The five-year-old has won five of his eight starts at Wagga and trainer David Heywood expects the five-year-old to perform well. “He is ready to go it’s just race fitness that he needs,” Heywood said. Heywood’s late brother-in-law Russ Milne died earlier this week and shares in the ownership of Man Of Peace. It will be a special moment for all connected with Man Of Peace when he races with members of the Milne family to attend. Heywood and Milne enjoyed a huge amount of success together with former Wagga Gold Cup winner Pride Of Indies one of their great success stories. Meanwhile, Baby Don’t Cry’s biggest concern may be where she lands in the run from barrier eight. It’s expected she will be back in the field and will have to unleash a similar finish to that which saw her defeat Gentleman Max and Zarlu last start. That form has been backed up by the same two horses filling the quinella in the Forbes Cup. “She has the right form and if she can run up to what she did last start then she will prove hard to beat,” Widdison added. Levee Bank will improve at her second run back from a spell and drops considerably in the weights as will Fox Tales. Mitchell Road is one of the most honest horses in training, while Lazyaxl can bounce back after failing last start. Lazyaxl won prior to that at Gundagai and has since trialled well suggesting he can hit back.